Walled off from the rest of the world, the fortress-like old town of Dubrovnik has narrow streets and tightly built houses. It’s a human friendly town where tourists like to flock and residents seem to flourish in peaceful appreciation for their beautiful neighborhoods. Yet here, perhaps among the leaves of a succulent, the grains of potting soil, or the black depths of a wall crevice, live the unseen inhabitants of the town: the10 Gnomes in Dubrovnik. But can you find them all? That is the question in this lovely continuation of Mateusz Skutnik’s point-and-click find-the-gnomegame series. In each scene, move your cursor to pan the camera angles, seeking out questionable spots which invite a closer look via the changing cursor. Investigate each view with precision if you intend to discover—and click on—every gnome before the ten minute timer expires. “10 minutes to find 10 gnomes?” You say, “Not a problem. They’re small, so how much time do they really need?” But this location is vast, despite its confined alleys and skinny doorways, and there are many times you’ll zoom so close you can see the thin fibers on a plant’s leaf yet still find no gnome. It could take several restarts and much more then 10 minutes to explore. Objects, such as a folded-up wheelchair or a single strand of human hair speak of the stories and life behind the walls, and you may end up too distracted to look for gnomes. Even if some of those elusive imps manage to elude your investigative efforts or if hidden object games are not your idea of fun, play 10 Gnomes in Dubrovnik as art for art’s sake. 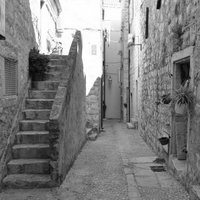 Skutnik’s photography captures Dubrovnik’s quiet, dignified beauty that is both serene and surreal. It’s a wonderful adventure to explore the art and architecture and life of this enchanting location. So take a look around. Who knows what surprises you might find? Maybe even a troll.